-The location is on the south of Switzerland on the border of Italy. Wallis has a lot of mountains and activities. In the winter you can go skiing, snowboarding, free riding, ice climbing and much more. It’s a big nature adventure park, especially for adrenalin freaks. For example in Zermatt, their ski slopes are 360km long. You can ride with your skis over the border to Italy, and go eat a original Italian pizza. In the summer, you can do big hiking tours, and get up to the top of the mountains. When you are searching for action you can go skydiving, downhilling and paragliding. The views from the mountains are amazing, and to get there is really easy. From the main train station you only need about 45 minutes, and 15min with the cable car. Then the world of the mountains are open for you. My favorite ski resort is Saas-Fee, because there is a big freestyle park for skis and snowboards because it is near my hometown. I just have to go to the bus, ride it for an half hour and the I arrive already. I love to ski and do some flips in the park. Yes you read it right, we have a dish that has the same name like the bacterial infection. The dish got the name when the cholera broke out in 1830 in Wallis, because the risk of infection the people would’t leave the house. That’s why the people have to make the food with the ingredients they have in the pantry. -Cut the leek lengthwise and wash under the cold water. Then cut the halves into strips of 2 to 3 cm and blanch them for a maximum of 3 to 5 minutes in lightly boiling salted water. Drain and quench under running cold water to stop the cooking process. -Cut the apples into small cubes and fry in a frying pan with butter. Increase and season the onions, leeks and apples. -Cook the potatoes in boiling water for 25 minutes.Then cut the potatoes in small cubes of 2 cm. Add this to the Apple and Leek onion mixture. -Rub the cheese in to the mixture. -Lay out a deep dish with puff pastry and spread the mixture on it. Cover with puff pastry. Bake in the oven for one hour at 170 ° C.
What is your favorite meal ? What your favorite hobbies ? What type of music do you listen ? Why did you choose Santa Barbara ? because of the sun and it’s s small city. Something that always made me sympathize with Obi Wan was the level of pain that he must have gone through when leaving Anakin there burning to death on the lava riverbank. This is someone who was like a little brother to him who he spent almost every day with since they met and taught him everything that he knew in respect to his master’s dying wish. Now one reason I think Obi Wan aged so terribly is because I can’t even imagine the nightmare that he must have gone through while Anakin was burning limbless screaming at him in pain. Now what if he hadn’t left Anakin on the floor to die ? What if he walked down the lava riverbank as he slips down with each step ? Looking at what Obi-Wan had done and what Anakin had turned into, how it wasn’t supposed to end this way. He grabbed him crying and telling him that he loved him, how he was his brother and that he wouldn’t leave him there. Anakin wanted to reach out and choke him, but knew he was only a fragment of the man that he used to be. Walking back into the ship with Padme and Anakin, they immediately were taken into a medical capsule and Padme to the delivery table. Yoda would come and see Anakin who just didn’t seem like a human anymore with a pain that he had never seen. At this moment Obi wan and Yoda saw the Emperor step outside of his shuttle and walk straight towards the Jedi master surrounded by his troops. The battle between the clones and the Jedi start and end quickly. With the use of the force, Yoda threw the clones in the air and pulled them together breaking all their necks. Darth Sidious ignited his spare red light saber and started the battle against Obi wan, blocking all the attempts of Sidious. 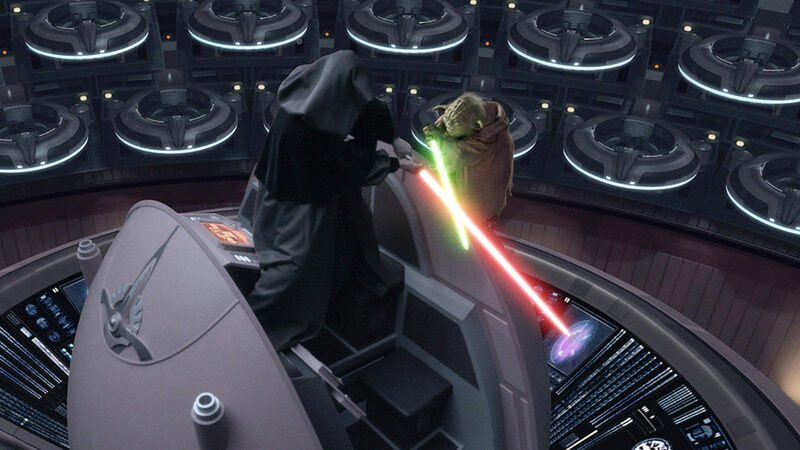 Obi wan gave time to Yoda to jump and kill Darth Sidious. Coming back to the ship, Padme would be next to the bed of Anakin with their two children watching the eyes of Anakin turning blue again. He was safe now. He started to talk with difficulty to apologize for everything that he done, the only thing that he wanted was to save Padme. Yoda starts to have new ideas about the force, the dark and light will no more be separated. It’s when we use the two with balance that the result is the best. It’s time for the Jedi to end, a new area will start now with new rules, with less chain than before and it’s only in that way that the tragedies that occurred will never be repeated.